I haven’t blogged as frequently over the past couple of weeks because I’ve been launching a new business with a friend of mine (it’s an online shop, Davies & Maker, selling lighting and lovely homewares if you want to check it out) and then last week my Mum and I headed to Spain for 5 days to visit my auntie and uncle. 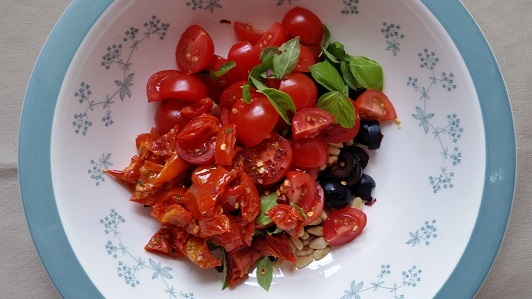 More of that later in the week; today I want to share this lovely tomato and halloumi salad with black olives and pine nuts. I’m having a couple of dairy-free weeks starting today so yesterday, when my partner said he fancied some sort of halloumi salad for lunch I was right there with him. I’ve made this tomato and halloumi salad quite a lot in the past but we hadn’t had it for a good while. It’s quite a luxurious lunch including a couple of more expensive ingredients like pine nuts and sun-dried tomatoes and it is very tasty. You can buy sun-dried tomatoes in oil in jars or by weight from deli counters. The ones in jars are handy to have in the cupboard because they keep for ages unopened but I do love the slow roasted tomatoes in oil from Morrison’s deli counter and that’s what I used here. For cooking I usually just have a jar of cheap pitted black olives in the fridge. They keep fairly well once opened and are handy to have in to add a handful to salads, pasta sauces, etc. This dish is lovely served with good fresh bread to mop up the juices. I have submitted this post to the May 2016 round of No Croutons Required run by Lisa from Lisa’s Kitchen and Jacqueline from Tinned Tomatoes. Check it out for more vegetarian soup and salad recipes. Put the pine nuts in a dry frying pan and heat on the stove for a few minutes until they start to turn golden. Shake them from time to time and keep an eye on them because they can burn very quickly. 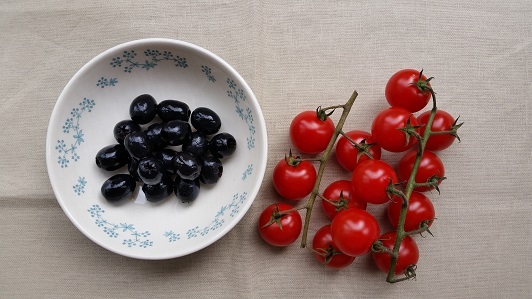 Combine the cherry tomatoes, black olives, half of the pine nuts and the basil leaves in a serving bowl. Take the sun-dried tomatoes out of the oil but don't worry about drying them off; the oil on them helps to dress the salad. Cut into small pieces (I find this easiest to do with kitchen scissors) and add to the bowl. Add the lemon juice and a good sprinkle of black pepper and stir everything together. Just before you're ready to serve the salad, heat 1 tbsp olive oil in a frying pan until hot and fry the halloumi for a minute or two on each side until golden. You can use a griddle pan here if you prefer. Place the halloumi on top of the salad, sprinkle with the remaining pine nuts, serve and enjoy! 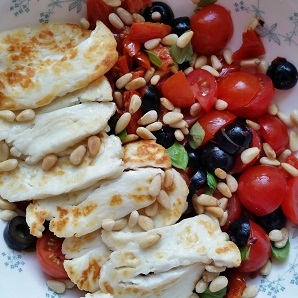 It looks delicious, I love halloumi and with pine nuts must be fab. That is so gorgeous. I love halloumi but as I am mostly vegan, haven’t had it for a while. I really want to try this dish though. Thanks for sharing with NCR. You’re welcome 🙂 I just did a dairy-free month and I think halloumi was the first thing I had once I was done!